This section examines the motivations among Chinese American philanthropists and their social impacts. Among Chinese American philanthropists, sector interests and personal affiliations were dominant factors for giving. Sectors frequently referred to were education, health, youth, community development and local area giving, and arts and culture. With respect to religious affiliation, Christianity was mentioned most frequently, but Buddhism and the complementing perspectives of Western and Eastern faith traditions were also described. Also among Chinese Americans, parents or ancestors as role models of giving were referenced, especially during times of poverty and wartime struggles. An example is Anla Cheng. Ms. Cheng described her mother’s influence on her while in Shanghai. Her mother came from a privileged and wealthy family, but nonetheless, she held great sympathy for those in need and encouraged her children to help others when possible. Describing another aspect of familial influence on her giving, Ms. Cheng expressed admiration for the giving tradition of her husband’s culture and the Jewish community. In rare instances, some Chinese American philanthropists were very explicit about their intention to have a social impact. One example is Patrick Soon-Shiong, who has dedicated his giving to solving health problems. Chinese American philanthropists frequently cited examples of funded projects with measurable impact. About one half provided illustrations. 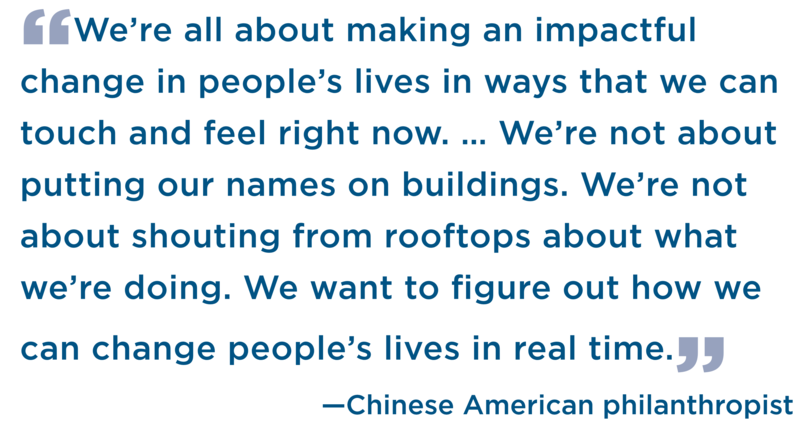 One possible reason for this relatively high level of frequency is attention to social impact in U.S. philanthropic culture in which Chinese American philanthropists or their staff consider the importance of reporting on impact. Among Chinese American philanthropists, there were at least two instances of independent evaluations of social programs. These evaluations included some type of controlled comparison enabling an estimation of impact. Examples include Andrew and Peggy Cherng and the Cherng Trust–supported study of The Leader in Me education program and the Clarence Ching Trust support of an evaluation of the PUEO program in Hawaii. The frequent instances of efforts to measure impact reflect some awareness of and attention to impact among Chinese American–funded initiatives. Among Chinese American philanthropists, explicit reference to participation in public forums about philanthropy was infrequent. These trends were similar to those found among Chinese philanthropists. Less than one fifth of Chinese American philanthropists identified in this study considered deliberately using varying degrees of communications. Even so, most of them have refused to give media interviews or only do so on rare occasions. Philanthropists chose to remain anonymous or to allow others to speak on their behalf. There were rare instances of Chinese American philanthropists who deliberately engaged the media to advance certain issues or to explain their giving choices under controversy. Among Chinese Americans, Mr. Oscar Tang and Ms. Agnes Hsu-Tang deliberately sought to serve as lead donors for the Chinese American: Exclusion/Inclusion exhibition in New York City due to the social significance of the project and a desire to lead by example. Among Americans of Chinese descent, about one third funded projects addressing their ethnic heritage or by partnering with entities in Greater China. Worth noting, more than half of Chinese American philanthropists referred to projects that involved Greater China, addressed issues of Chinese American heritage, or promoted Chinese cultural preservation. Those that did not explicitly reference projects with some aspect of Chinese heritage tended to focus their work on scientific and technological endeavors and cited advances in those fields as benefiting humanity in general or advancing understanding for all. An example of philanthropists’ giving based on ethnic heritage is higher education. Chinese American philanthropists have prioritized supporting the global education of Chinese students. China is becoming increasingly economically and socially developed, and it needs to be able to navigate and guide global dynamics. Developing the country’s youth to become future leaders who can operate in a global context is essential. Philanthropists such as Victor and William Fung have sponsored fellowships for Chinese students to study abroad, and James Chao and his family have supported Harvard Business School to create an executive center named in honor of Ruth Mulan Chao to train students from all over the globe. Chinese American Mr. Duan Yongping and Ms. Liu Xin have funded Ohio University to support Chinese students pursuing careers in communications and as entrepreneurs. Finally, this review of Chinese American philanthropists’ giving also revealed constructive approaches to working with governmental partners and others engaged in collectively solving systemic problems. For example, Ronnie Chan has partnered with the Chinese government to restore portions of the Forbidden City. In the United States, John and Anna Sie have commissioned studies to boost U.S. federal funding to better understand Down syndrome, and Coleman Fung has engaged government and nonprofit entities in cross-sector collaboration to serve military veterans. These examples illustrate a range of governmental partner engagement strategies such as policy education, demonstration projects that government agencies can scale, and cofunding of partnerships to bring resources to complex, system-wide problems.